It was a particularly great few post-Christmas days. And now with good friends in the Hamptons, working with a dog at my feet, so no complaints here! Coconut sugar will definitely work in the recipe, but I’m not sure of the top, since it’s a larger crystal. Maybe a whirl in a food processor or mortar? I got my butane at a hardware store. A pharmacy might have it too, for lighters. YOU are awesome. How fun! Can I live vicariously through you? Oh to be on a date….enjoy! I do enjoy my family life, kids tugging at pant-legs, but a date sounds marvellous, especially a date where the man cooks! The creme brulee looks divine. Does it have a coconutty taste? I do hope so. Lovely as usual ! It doesn’t have a highly coconuty taste because of the abundance of fresh vanilla, but yes, definitely it’s there. I want to eat this again now! Happy Belated Christmas little Kitchen Wizard – this one sounds great! And so does this second date! This looks delish!! I love being able to break that super fine layer of carmalized sugar on top! You’ve got to love (or at least really appreciate!) a man that can cook! My husband is a great cook and it makes life so much easier when we can share the duty and still eat great food all the time. Here’s to a third date! The creme brulee looks fantastic and I love the coconut milk substitution. Although, put coconut in anything and I’m bound to go crazy! THANK YOU for this!! I have missed creme brulee so much! My pleasure! I’d missed it for so long – and it’s so much easier to make than I would have expected! Hi! I just received this recipe/link from a friend and I am sooo excited to try it! I have been gluten/casein free for about a year now. I would LOVE to talk to you because I read that you are a “veteran of Lyme Disease,” I have been suffering from joint inflammation for over 12 years now, and just received a Lyme Disease diagnosis. I would be very interested in finding out what you’ve learned! This post is full of so many great things. Second dates, Mad Men, coconut creme brulee, cocktails, and Mark Paul Gosselar (I love him). Sounds like you’ve had a great week! And, as usual, this is a great recipe. I adore this post. Thank you miss Lindsay! It was a great week, full of relaxing moments to balance out the chaos! Yay! I love it – making an adaptation already for the third date tonight :) Meyer Lemon Brulee Tart! Stunning blog – so happy to have found it! My son is lactose intolerant and this would be a real treat for him. We have been turning to coconut milk more and more often. Wonderful job! Good luck with Date Man! My husband man is still not cooking for me!!! Ooh yay for fun dates who can cook you dinner! :) And I had to laugh because I saw that holiday movie… I not so secretly love holiday tv romance movies, and yet I have not seen a good one in years! The sad thing is, the Mark Paul Gosselar (sp?) one was the best of the 3 I’ve watched this year…which tells you how bad the others were. Hi Jacqueline, a wonderful blog and a great recipe which I need to try (since coconuts are after all abundant here).. I recently did Crema Catalana which is the Spanish version of Creme Brulee (they keep arguing who came up first with the recipe). Oooh, I love creme brulee, and coconut milk sounds lik such a lovely twist on i! Wonderful! what is a gluten-free diet? Like what must you not eat and what will happen if you accidentally eat it? Do people choose to go on a gluten-free diet like how some choose to go vegetarian or is it born? Btw, i love your post. The date sounded really relaxed and smooth. Keep posting! Gluten is a protein found in wheat, spelt, and other grains. It gives foods that wonderful chew that we love in bread and pastry and the like. Many people are allergic to it – if they eat it it affects their digestion, energy, bone pain, skin… lots of different symptoms. So omitting it isn’t a choice such as being vegan, but a medical necessity. Thanks for stopping by – I love your site! Wow, I never thought of using anything else to make my creme brulee with, I love coconut milk, I can just imagine how delicious it was! Thanks for the inspiration, and Happy New Year! Gorgeous. Decadent. Slooooow clap comin’ from over here. WOW! I’m so glad I stumbled onto this, I thought creme brulee was out of my life once I went gluten/dairy-free. Can’t wait to try this, thanks! Yay – best comment EVER! Creme brulee is something I too almost thought I wouldn’t be able to have again, but it’s rather easy once you get the hang of it. Please let me know how it comes out if you try it! 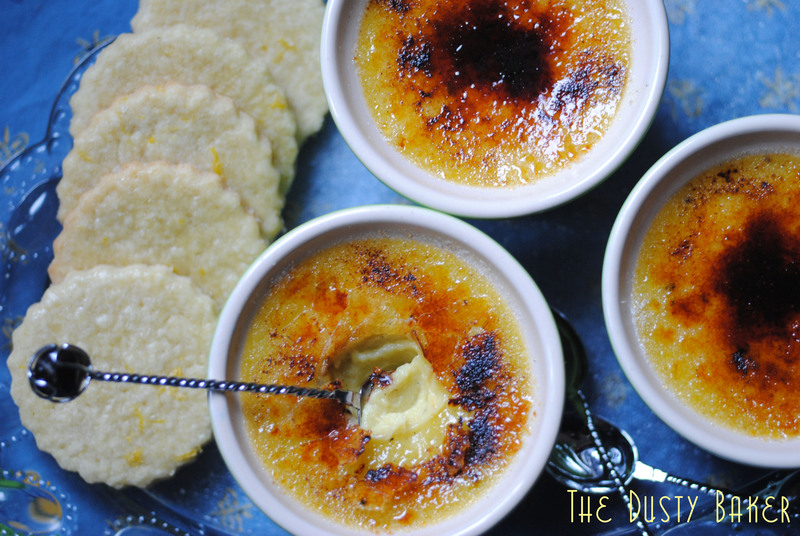 I’ve been dreaming of coconut creme brulee and that’s how I found your adorable blog. I can’t wait to try it, and looking forward to exploring more of what you’re offering here. Looks great!!! Thanks so much! Let me know what you think, and thanks for exploring! Have adapted it by putting pineapple in the bottom of the ramekin prior to cooking and it’s yummy. Just saw your recipe and am going to try it tomorrow night for my family. Any idea how to add unsweetened or bittersweet chocolate and make “Chocolate Creme Brulee”? My GF/DF daughter really misses creme brulee (it’s cute; she’s 7). Which coconut milk; the one in the can or carton? I read through some other comments. The torches are sold at stores like Williams Sonoma, etc. Thanks! Look for coconut milk in the dry goods section near the soy and almond milk. It’s made by So Delicious and is also carried by Trader Joes. It’s a thinner version of the can. Coconut water is just the water and would not be a good substitute. The unsweetened coconut milk in the carton is a great milk replacer for cooking as it doesn’t have a coconut flavor and also has a slightly thicker consistency. Hope you find it to try! Oh, right! I DEVOUR coconut water but only ever bake with the coconut milk in a can – almond milk is my regular milk replacement so I honestly haven’t even tried the cartoned coconut milk kind. I see it everywhere – will definitely try it, thanks! so there is no warming of the coconut milk to warm the vanilla bean? you just split it and scrape it? I just scrape the bean, but infusing into the coconut milk would definitely add if you want it even richer. I haven’t felt a need to get more in there, but let me know how it goes if you do!